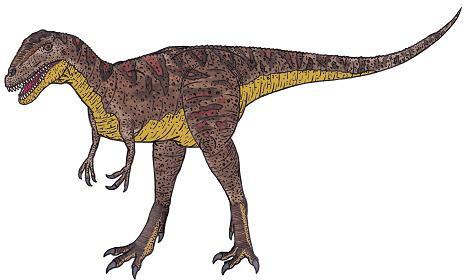 Carcharodontosaurus was a carnivorous (meat-eating) dinosaur that lived in Africa during Cretaceous period. between approximately 98 to 93 million years ago. Carcharodontosaurus was 36 to 44 feet (11.1 to 13.5 meters) long. tall, and probably weighed approximately 6 tons. 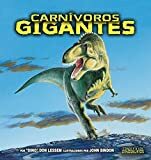 For a while it was thought to have had the largest skull of any Theropod dinosaur (partly because of misinterpretation of incomplete fossils), but today that honor is held by its relative Giganotosaurus. The first fossils of Carcharodontosaurus were found in 1927, are were initially named "Megalosaurus saharicus" (the name "Megalosaurus" was once used to refer to numerous different Theropod dinosaurs). The name "Carcharodontosaurus" was chosen by Ernst Stromer von Reichenbach in 1931 and refers to the animals to the animal's shark-like teeth (von Reichenbach considered the teeth to resemble those of Carcharodon, the Genus of sharks which includes the modern Great White Shark, and the extinct giant shark, Megalodon). Unfortunately, all earliest found fossils of Carcharodontosaurus were destroyed during World War II - however, fortunately, new fossils have subsequently been found in Morocco (1995) and Niger (1997). African Dinosaurs - Carcharodontosaurus lived in Africa. Carcharodontosaurus was a genus of dinosaur. "Carcharodontosaurus" means "shark tooth lizard". Carcharodontosaurus was a member of the Saurischia ("lizard-hipped") order of dinosaurs. What this means, is that although Carcharodontosaurus was not closely related to lizards, it did have similarly shaped pelvic bones. Carcharodontosaurus was a Theropod - a member of a group of related bipedal dinosaurs that included the ancestors of birds (although Carcharodontosaurus was not itself an ancestor of birds). Carcharodontosaurus lived between about 98 million years ago and 93 million years ago, during the Cretaceous period. Carcharodontosaurus was a carnivore (meat-eater). Carcharodontosaurus was about 36 to 44 feet (11.1 to 13.5 meters) long. Carcharodontosaurus weighed about 6 tons. Drei Jahre nach den Vorkommnissen in "Die vergessene Welt" versammelt Professor Challenger wieder seine alten Gefährten: Professor Summerlee, den Abenteurer Lord John Roxton und den Reporter Malone. Das Ende der Welt soll nahe sein. Sir Arthur Conan Doyle schrieb neben seinen bekannten Sherlock Holmes-Geschichten auch mehrere Abenteuer rund um die Figur des Professor Challenger. "Die vergessene Welt" diente etlichen Fernseh- und Filmproduktionen als Vorlage. In diesem spannenden, aber dank der berühmtem britischen Spleenigkeit auch äußerst humorvollem Werken, findet sich der Vorläufer aller Jurassic Park-Bücher von Michael Crichton. Der vorliegende Band ist mit 23 Zeichnungen geschmückt und mit Fußnoten kommentiert. “Dino” Don Lessem brings readers face-to-face with various dinosaur species, detailing their habitats, way of life and how they became extinct. An acclaimed dinosaur expert, Don Lessem has written more than 30 children’s books, writes a popular dinosaur column in Highlights magazine, and was an adviser for Jurassic Park. Take a trip through dinosaur time to meet these giant meat eaters face to face: Tyrannosaurus Rex had sharp teeth the size of bananas! Allosaurus had huge hands with three sharp claws! Giganotosaurus weighed twice as much as an elephant! Plus, you'll get to know Albertosaurus, Carcharodontosaurus, Deltadromeus, Dilophosaurus, and Spinosaurus! Um 1910 reist der exzentrische Professor Challenger mit einer Expedition in den Dschungel des Amazonas. Ausgerüstet mit einer alten Landkarte begibt sich eine bunte Truppe auf die Suche nach einer vergessen geglaubten Welt und entdeckt tatsächlich seit Millionen von Jahren ausgestorbene Dinosaurier. Doch die faszinierende Reise entwickelt sich für alle zu einem Albtraum. Gefahr droht nicht nur von den Riesenechsen, sondern auch von feindlichen Affenmenschen. Es beginnt ein Kampf ums Überleben. Sir Arthur Conan Doyle schrieb neben seinen bekannten Sherlock Holmes-Geschichten auch mehrere Abenteuer rund um die Figur des Professor Challenger. "Die vergessene Welt" diente etlichen Fernseh- und Filmproduktionen als Vorlage. In diesem spannenden, aber dank der berühmtem britischen Spleenigkeit auch äußerst humorvollem Werk, findet sich der Vorläufer aller Jurassic Park-Bücher von Michael Crichton. Der vorliegende Band ist geschmückt mit 8 Zeichnungen der deutschen Erstveröffentlichung und mit Fußnoten kommentiert. The prehistoric Carcharodontosaurus is one of the longest and heaviest known carnivorous dinosaurs. This new quality figurine will help bring this era to life in your little one’s playroom. Learn more with our Carcharodontosaurus. Discover the joy of educational play. Great for teaching children about prehistoric animals through the joy of imaginative playing. Each figure is finely hand painted. Suitable for children aged 3 years and above. 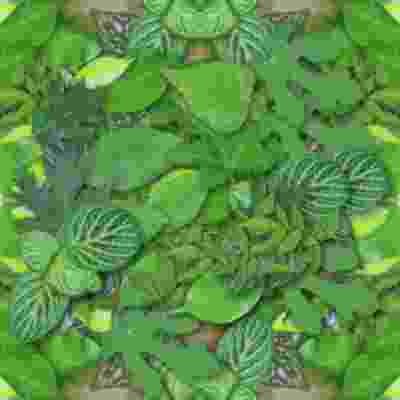 We carefully craft our product for the most perceptive eyes of all - those of a child. Our quality figurines last a lifetime. They’re durable collectables your children can play with. All CollectA products are rigorously tested to ensure they meet the highest safety standards. Each prehistoric sculpture has been approved by Anthony Beeson, a well respected expert in palaeoimagery who is also an art librarian, archaelogist and collector, based in the city of Bristol, England. 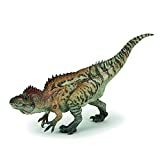 Carcharodontosaurus means "Great White Shark-toothed lizard"
Each of the Collecta deluxe models comes with a little plastic palaeontologist know as "Sir Arthur Gauge". Sir Arthur comes complete with pickaxe and binoculars and provides scale for each model. This really allows the size of the Carcharodontosaurus to be appreciated. Each prehistoric figure in the CollectA collection has been approved by archeologist Anthony Beeson, a well-respected expert in paleoimagery. All CollectA models are individually hand crafted to the highest standards and made with the finest and safest phthalate-free, lead-free materials. Create a natural world in miniature with high quality toy replicas from CollectA. Our mission is to educate collectors and to provide the greatest oppportunity for creative play. Carcharodontosaurus is a genus of carnivorous carcharodontosaurid dinosaurs that existed between 112 and 93.5 million years ago, during the early Albian to early Turonian stages of the mid-Cretaceous Period. It is currently known to include two species, C.saharicus and C.iguidensis, which were among the larger theropods, nearly as large as or even larger than Tyrannosaurus, Giganotosaurus and Spinosaurus. PREHISTORIC ANIMALS - Tyrannosaurus rex, the so-called 'king of the tyrant lizards', is probably the most famous dinosaur of all time. At up to 40 ft long, it remains one of the largest known meat-eating dinosaurs. Carcharodontosaurus was one of the largest meat-eating dinosaurs of all time. This terrifying theropod was named after the great white shark, Carcharodon, and rivalled the mighty T-rex in both size and ferocity. MADE WITH INDUSTRY-LEADING STANDARDS - Each figure has been individually hand painted, is detailed and realistic, and features quality construction from phthalate and lead-free materials and includes an educational hangtag in 5 languages. 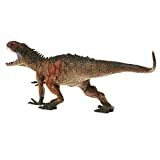 PRODUCT SPECIFICATIONS - This package includes (1) Safari Ltd Wild Safari Prehistoric World collection Feathered Tyrannosaurus Rex that is 12.6 x 5.8 x 4.8 inches and (1) Safari Ltd Wild Safari Prehistoric World collection Carcharodontosaurus that is 9 x 4 x 3.9 inches. Tyrannosaurus rex, the so-called 'king of the tyrant lizards', is probably the most famous dinosaur of all time. At up to 40 ft long, it remains one of the largest known meat-eating dinosaurs. Carcharodontosaurus was one of the largest meat-eating dinosaurs of all time. This terrifying theropod was named after the great white shark, Carcharodon, and rivalled the mighty T-rex in both size and ferocity. 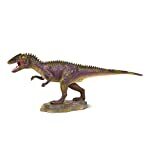 Created for the dinosaur lover in us all, these replicas are slightly smaller than the Carnegie Dinosaur Collectibles and were designed to introduce the fascinating landscapes and creatures of the prehistoric world. Each figure has been individually hand painted, is detailed and realistic, and features quality construction from phthalate and lead-free materials and includes an educational hangtag in 5 languages. Realistic, educational, and fun, this figurine is suitable for a range of interests, including collectors, enthusiasts, teachers, and kids. Admire it on a shelf, use it in the classroom, or simply enjoy playing with it. 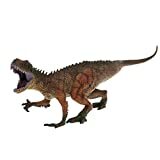 This package includes (1) Safari Ltd Wild Safari Prehistoric World collection Feathered Tyrannosaurus Rex that is 12.6 x 5.8 x 4.8 inches and (1) Safari Ltd Wild Safari Prehistoric World collection Carcharodontosaurus that is 9 x 4 x 3.9 inches.